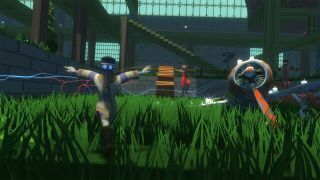 Cult of the Wind stormed through Steam Greenlight on the back of a childhood memory: running around making airplane noises, outstretched arms smacking into anything foolish enough to get in the way of a pretend Spitfire (sorry, my sister). Its multiplayer "human dogfights" looked like silly fun in the trailer, and now that it's out, I'm down for some childhood regression if anyone else is. So, is anyone? No? I'd love to know whether or not Cult of the Wind succeeds at all the silliness that got it through Greenlight , but no one is playing it. It left Early Access a couple weeks ago, and it's completely empty—there's only one dedicated server running, and I haven't seen anyone in it yet today. I even sat in the server for an hour, hoping to entice someone to join me, but no one came. There are no bots, so unless Cult of the Wind finds a population, you'd be better off running around shooting 'pew pew pews' in the direction of neighborhood cats. There are lots of graphics options, a simple character customization system, and a great little level editor included, but I can't play (or review) Cult of the Wind unless someone else joins that lonely official server or makes a new one. For now, I'll just have to score it an 'oh dear' out of 'well that's too bad, isn't it?' It might be fun with friends, but who's going to convince their friends to buy a game without actually playing it first? Even if it's still in development, I'll be surprised if Cult of the Wind can be saved. If it were free, I'd suggest that players might trickle in until the word-of-mouth snowball starts rolling, or at least until it earns a small, dedicated community. At its current price ($15/£11), and without a stable population after more than two weeks, I have much less hope. PC gaming is an odd, tough world when more people are playing Quake II than a game resoundingly voted onto Steam just a few months ago.